Maps of Antarctica used to be notoriously low resolution. But that’s changed with a new map that researchers say is not only the most detailed survey of the South Pole in history, but also the best map of any continent. To create the map, researchers at the University of Minnesota and Ohio State University gathered millions of stereoscopic images taken of Antarctica by satellites between 2009 and 2017. Then they used the Blue Waters supercomputer at the University of Illinois at Urbana-Champaign to stitch those 150 terabytes of data together into a map that shows both the visual terrain of the frozen continent and its elevation at every point. 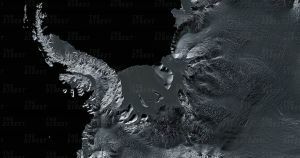 The result is the Reference Elevation Model of Antarctica (REMA), a map so accurate that you could spot a single car parked on an ice shelf, according to the New York Times. The researchers also set up a page where you can explore REMA yourself. According to REMA’s creators, the map will help researchers plot safer routes between science stations. It will also be useful in the battle against climate change. The plan is to update REMA at least once per year, which will let climate researchers track melting ice, thinning glaciers, and the activity of rivers and volcanoes.